I recently received a pro-Brexit pamphlet through my door that argues I should vote for Britain to leave the EU because of the danger that further EU expansion into the Balkans will result in more immigrants from the Balkans coming over (see image, above). The Albanian Option. It sounds like a John le Carré novel. You imagine a story with political intrigue, huge sums of money going astray, criminality and double-dealing. And you’d be right. But the Albanian Option isn’t holiday reading fiction — it’s diplomatic fact. Albania is on course to join the European Union — alongside four other countries, Macedonia, Montenegro, Serbia and Turkey. The already unwieldy group of 28 is due to become a throng of 33. And Britain isn’t just backing this move. We’re paying for it. Every week we send £350 million to the EU. And now millions of your hard-earned taxes are being directed to these five prospective members. Between now and 2020 the United Kingdom will pay almost £2 billion to help these nations prepare for membership of the EU — that’s more than we will spend on the NHS Cancer Drugs Fund over the same period. This bounty will be our greatest gift to Albania since the comic talent of the late Sir Norman Wisdom, that country’s improbable national hero, lit up the dark days of Stalinist dictatorship. Indeed, I wonder if the Albanian people are now convinced that Britain’s Foreign Office is full of Norman Wisdom characters, lovable chumps whose generosity and good-heartedness make them easily gulled into accepting all sorts of bad advice. How else could they explain their good fortune in being on the receiving end of a £2 billion Balkan bonanza? As Justice Secretary, I am well aware that there are around 10,000 foreign criminals in our jails — and one in 20 of those is Albanian. Of all the prisoners in our jails who come from European countries, 10 per cent come from Albania — yet Albania comprises less than half of one per cent of the overall population of Europe. Those prisoners currently cost the British taxpayer almost £18 million a year to keep in custody. And that’s before Albanian citizens even have the right to move to the UK! The Home Secretary knows the problem is very far from diminishing. Already this year we’ve seen 20 gangsters from Albania convicted of running a brutal drugs ring in Manchester. Of course, as the Home Secretary rightly noted, Albania is not the only accession country with an organised crime problem. Albania’s neighbour on the Adriatic Sea, Montenegro, has a breathtakingly beautiful coastline and romantic interior. It also, unfortunately, has mafia gangs, a reputation as a centre for money-laundering and a record for narcotics trafficking. The prime minister, Milo Djukanovic, has been a leader of the country almost continuously for the past 30 years. He started as a Communist apparatchik and friend of the murderous Serbian dictator Slobodan Milosevic. But today he is a fan of the European Union and chummy with EU power brokers. Has everyone got that ? Albanians and Montenegrins are basically all criminals and we need to leave the EU to stop them flooding into our country and swamping it. Huge, China-sized countries that they are. 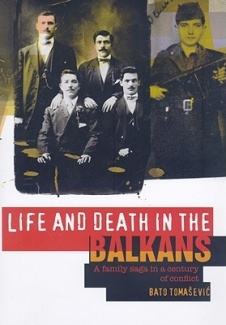 Gove’s exploitation of stereotypes of Albanians and Montegrins as criminals echoes the sort of propaganda popular among the supporters of Slobodan Milosevic and his successors, who first attempted to destroy the Albanian people of Kosovo as a group, then to deny their state international recognition. Note that Gove does not distinguish between Albanian criminals and Albanian people in general. Consider this sentence: ‘I wonder if the Albanian people are now convinced that Britain’s Foreign Office is full of Norman Wisdom characters, lovable chumps whose generosity and good-heartedness make them easily gulled into accepting all sorts of bad advice. How else could they explain their good fortune in being on the receiving end of a £2 billion Balkan bonanza?’ He is concerned that ‘the Albanian people’, not just Albanian criminals, might consider British officials to be ‘chumps’. Albania has been one of Britain’s staunchest allies over the past two decades. Its troops have fought alongside ours, sustaining casualties in both Iraq and Afghanistan. Gove is, of course, a neoconservative who strongly supported the US-led intervention in Iraq to overthrow Saddam Hussein. While the Albanian troops were shedding their blood in support of the unpopular intervention in Iraq, while other British allies refused to step forward, Gove did not say at the time ‘Go home; we don’t want you on our side as you’re a bunch of criminals and scroungers.’ No, he waited until the Brexit campaign cynically to stab them in the back. Though it is not inconceivable that he launched his anti-Albanian tirade in a fit of pique after his suggestion that the UK could form part of a ‘free-trade zone’ of countries outside the EU, along with Albania, was trashed by the Albanian prime minister, Edi Rama. His portrayal of Montenegro’s Djukanovic as a ‘friend of the murderous Serbian dictator Slobodan Milosevic’ is another exercise in cynicism, given that Djukanovic has been a longstanding ally of the West who, as Montenegro’s president, visited Tony Blair in London during the Kosovo War in 1999 to declare his opposition to Milosevic’s policy – at considerable personal risk, given Montenegro was then under the military control of Belgrade’s forces. Gove did not express any dissent from this policy at the time. He thus subscribed to a political vision that was outward-looking, seeking to combat totalitarianism and human-rights abuses, and promote Western liberal-democratic values across the world, and that sought to embrace Albania, Montenegro, Turkey and other Balkan states as allies in this project. He has now done a 180-degree turn, and subscribes to a political vision that is inward-looking and isolationist; the counterpart of Donald Trump’s call for a wall to be built against Mexican immigrants. Instead of seeking to export our positive values, Gove wants to keep the outside world out. No longer allies, Balkan states in Gove’s eyes are now threats; sources of immigrants who will come over, import crime with them, steal our jobs and scrounge off our taxpayers. The tension in neoconservatism was always present between its positive, optimistic, liberal-interventionist tendency that perceived a world inhabited by sisters and brothers in need of solidarity and freedom, and its regressive, pessimistic, Islamophobic and anti-immigration tendency that perceived a world inhabited by hordes of unredeemable economic migrants and jihadis. Orcs, one might say. Gove’s definite defection to the second tendency is a powerful indication of the movement’s degeneration. What a disgraceful, miserable political evolution Gove has undergone. A powerful European union of democratic states including all the countries of the Western Balkans and, one day, a fully democratic Turkey is one we Brits should be proud to be part of.